If you thought you’ve heard it all when it comes to cooking, wait until you read about the Pantelligent Intelligent Frying Pan. This unique cooking utensil is perfect for beginners and wonderful busy cooks. 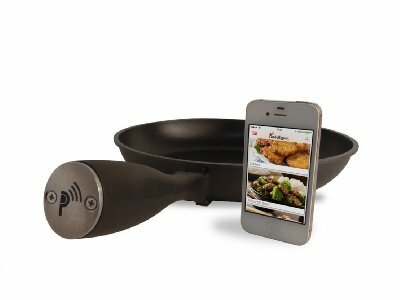 Even for those who think they know everything about cooking with a frying pan, Pantelligent will show them something new. Many inexperienced cooks like the detailed step by step recipes they can follow for oven cooking. That’s because there’s a thermostat and temperature and timer dials you can adjust according to a recipe. If you follow a time tested recipe to a T, there’s nothing much that can go wrong. With stovetop pan cooking, however, how do you know when the pan is hot enough or too hot to add the food to be cooked? How do you know if a piece of meat is cooked through when the temperature of the pan keeps changing? That’s where Pantelligent smart frying pan comes in. Pantelligent was actually funded as a start-up project, and it is now in production. It is not an inexpensive unit, but what it can do for your cooking might be worth every penny spent. The handle is filled with computer sensors and chips that are accessed by a bluetooth capable smart phone. Those are the brains of this frying pan. To control it, you simply download the Pantelligent app and away you go. Your phone turns into a control panel that gives you all the information you’ll need for cooking, essentially turning your phone into a Pantelligent monitor. The Pantelligent download comes with a complete recipe book, and you’ll be able to cover virtually every type of food you want to eat. All you need to do is to punch in the correct data, and let the pan and the app do all the work. Let’s say you want to cook a steak on your electric or gas stove. Go to the steak portion of the recipe book and enter how much the steak weighs, how thick it is and whether you want it rare, medium or well done. Turn on your stove, put the pan onto the burner and let it heat up. When the pan is at the perfect temperature, the app will tell you when to place the steak into the pan. The next step is to let the steak cook for as long as the apps says. If the temperature gets too hot, it will tell you to turn down the burner, and when it’s time to flip, it will tell you that too. It automatically adjusts the cooking time until the food is done. If you want even more hands off cooking, you can purchase the optional Autopilot accessories so that even the temperature is controlled by the system and you can carry on with other kitchen work until you get an alert to come back and either turn or stir the food or turn off the stove. These optional third-party accessories include a compatible countertop electric burner and WiFi enabled power switch. Both these are recommended by the makers of Pantelligent for this use. When the steak is finished, the app will let you know it’s done and when it’s time to take it off the heat. That’s it! Your steak will literally be as good as one at any steak house and you’ll be able to do this all in the comfort of your own kitchen. By using the recipe book, Pantelligent will always make sure your food is perfectly done, from salmon to chops, chicken to ribs, veggies and kabobs and everything in between. The actual pan is made of heavy duty aluminium for even heat distribution. The handle is made of a heat resisting composite so it will always be safe to touch. It is also ergonomic and easy to grasp and hold on to as well. It’s a large 10 inch pan, so you’ll always have room for plenty of food. It has a very easy to clean non-stick surface. You can use it to cook virtually any food inside. With this type of brand new technology, you might think that it is difficult to understand and learn. But that is not the case at all. The phone app makes everything as simple as just following basic instructions for any type of food that you desire to cook, and as long as you do that, you will not have any problems. The interface will actually talk to you, so when it is time to flip your meal, it will alert you both visually and audibly. Nothing could be simpler, just do what the app says and you will be set. Virtually effortless frying with near perfect results every time. No fancy hardware, just a frying pan and an app that goes along with it. As easy to use as following basic directions. Nothing complicated and no hard to understand directions either. A PTOA (Teflon) free non-stick coating for healthy eating. The coating is so good that in most cases you can damp wipe it clean. The PTOA coating is easy to protect, as the app will alert you if the temperature goes above 500F, so you can turn the heat down or off before extra high heat damages the coating. Very expensive. All of this cutting edge technology does not come cheap, and you’ll have to decide if making literally perfect meals time after time is worth the cost. The app can be somewhat annoying for more experienced cooks. For example, as the pan heats over the course of a meal, the voice may be constantly reminding you to turn the heat down so as to not overcook or burn the food. Has to be hand washed in the sink, as it is not dishwasher safe. Not compatible with induction stovetops. Make absolutely no mistake about it, this is one of the neatest ideas to ever happen to a frying pan. It may also be one of the more useful smart kitchen gadgets available so far and not just a gimmicky one from the hot Internet of Things trend. The Pantelligent is beyond perfect for beginners, since it is drop dead easy to use. Just download the app, put the pan on the heat and go. And that’s really all there is to it. On the other hand, how many beginners out there are going to be able to shell out the cost of buying into this appliance? It’s probably not something any experienced chef will ever need. Take a look at the video below to find out for yourself. Is it the best frying pan on the planet? Yes!! Is it worth the cost? Well, you’ll have to decide that one for yourself.